In January I presented data from the CDC’s National Youth Tobacco Survey showing that e-cigarette experimentation since 2011 did not produce an epidemic of teen smoking (here). The 2017 Monitoring the Future survey, illustrated in the chart at left, provides further evidence of a steady decline in cigarette smoking among high school seniors. In 2017, the smoking rate in MTF dropped below 10% for the first time in history. At 9.7%, the rate is almost half that of 2011 (18.7%), while the vaping rate remained at 16-17%. 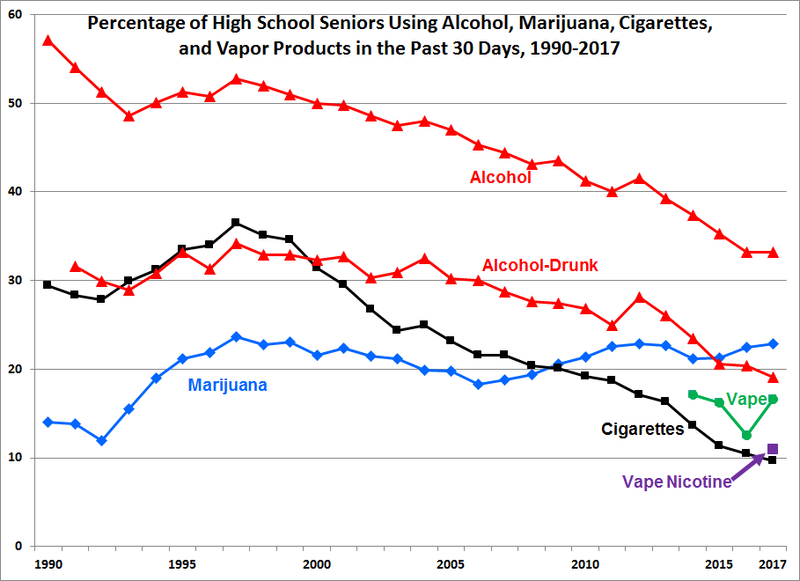 Meanwhile, high school seniors used alcohol and marijuana at far higher rates than cigarettes (33% and 23% respectively). Nineteen percent of seniors reported being drunk in the past month. MTF vaping data in 2014-2016 didn’t specify the liquids used; in 2017 MTF collected information on non-specific vaping and vaping nicotine and marijuana in the past month. Nonspecific vaping, illustrated by the green line in the chart, was around 16%, nicotine vaping was 11%, and marijuana vaping was 4.9% in the past month. Federal officials should stop claiming that vaping is a gateway to smoking, because evidence is absent in all federal surveys. 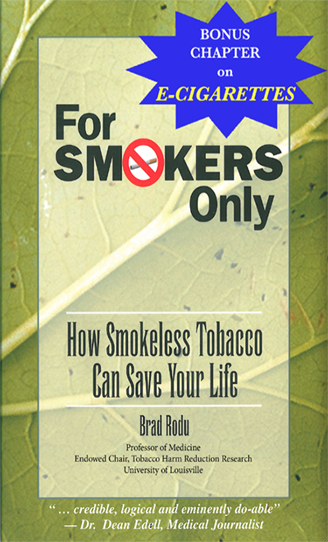 The influential journal Science recently posted on its website an article (here) on the Foundation for a Smoke-Free World, an organization funded by a pledge of almost $1 billion from Philip Morris International. The Foundation supports tobacco harm reduction research with a stated goal of “end[ing] the production and use of combustible cigarettes and help[ing] smokers switch to less dangerous alternatives.” Asking, should scientists take the funding, the article clearly leans toward “no”. As I have written, government funding, predominantly from the National Institutes of Health, keeps academic research aligned with a vision of a tobacco-free society (here). NIH’s opposition to tobacco harm reduction dates back to the mid-1990s, as seen in the agency’s efforts to undermine my research and reputation (detailed in Jacob Sullum’s book, For Your Own Good, here). 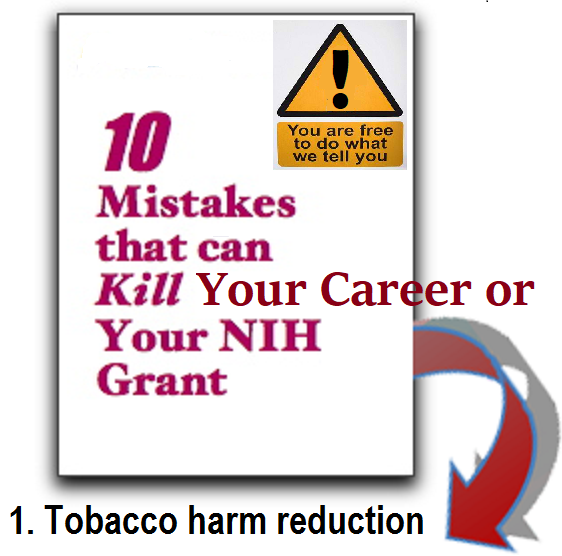 The Science writer casts me as “a harm reduction advocate…who for years has relied on tobacco money,” despite my record of 65 published professional articles (available here, with PubMed links) and 24 years of scientific endeavor, 19 of which were supported by unrestricted grants from tobacco companies to, and administered by, two universities. Elsewhere in the story, an individual with half as many published articles is respectfully described as a “tobacco control researcher” as he terms the Foundation a “scam”. I support academic freedom, including the right to use research funding from any lawful source, accompanied by total transparency and full disclosure. Research ought to be judged on its merits, using objective standards of quality and accuracy. The Foundation director is, regrettably, prescient in anticipating “harassment of grantees and staff” and “ad hominem attacks”. Such behavior is, as he notes, unacceptable. These numbers, while unfortunate, pale in comparison to growing misperception among American smokers. These are the people whose lives will be shortened if they don’t quit. In the chart I summarize a disheartening trend. 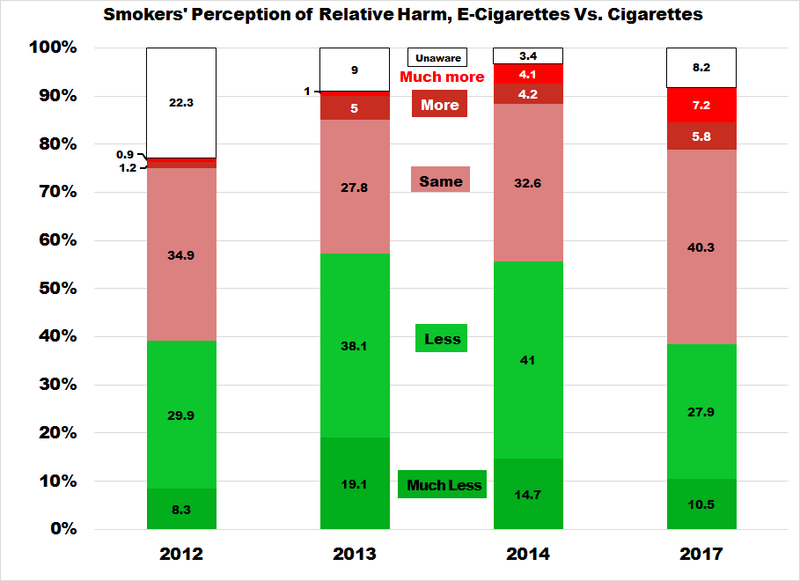 In 2012, 38% of smokers correctly believed that vaping was safer than smoking (the green zone on the chart); the percentage increased to 57% a year later. In contrast, about 37% and 34% of smokers thought e-cigs were equally or more harmful in those years (the red zone). A slight decrease in accurate perceptions (green, at 55%) was seen in 2014, while those with misperceptions grew to 41% (red). HINTS did not survey smokers again about the comparison until 2017; at that time, accuracy dropped to 38% (green), and misperception rose to 53% (red). The sharp increase in misperceptions coincides with a sharp decline in smokers who vaped, from 6.3 million in 2014 to 4.1 million in 2016, according data from the CDC (here). This is a national disgrace, driven by hundreds of millions of taxpayer dollars spent on anti-tobacco, anti-tobacco-harm-reduction research (here), with fawning complicity by the media and ill-advised endorsement by public health officials and major medical organizations. Smokers are the unfortunate victims of this irresponsible crusade.